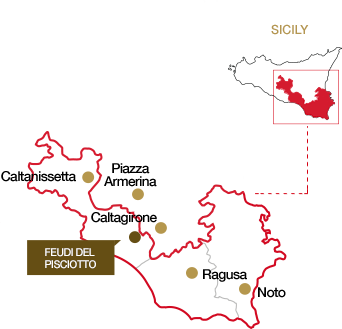 A land of extraordinary characteristics, Sicily has emerged only in recent years as a region of great wines, with a climate and soils that are a guarantee of high quality. The region, which the Greeks and Romans called Enotria by virtue of its celebrated suitability for vine cultivation, is home to Feudi del Pisciotto - 40 hectares of vineyards lying around 7 km from the sea and 250 meters above sea level. The soil mixture is rich in skeleton and the vineyards benefit from two climatic moderators - altitude and the sea - that give the wines a recognizable stamp of sapidity and freshness. The "Ulmo" vineyard, where the Nero d'Avola grapes originate, is distinguished by some unique characteristics: extremely rich in limestone and skeleton, it has a medium clay content and an east-west exposure which gives the wine body and sensory notes that are particularly suitable for development over time.